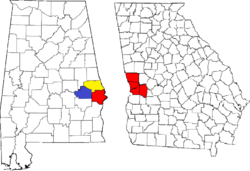 Chambers County is a county of the U.S. state of Alabama. As of the 2010 census the population was 34,215. Its county seat is Lafayette. Its name is in honor of Henry H. Chambers, who served as a United States Senator from Alabama. Chambers County is included in the Valley, AL Micropolitan Statistical Area and the Columbus-Auburn-Opelika, GA-AL Combined Statistical Area. Prior to contact with people of European descent, what is now Chambers County was inhabited by the Creek nation. Chambers County was established on December 18, 1832. Pat Garrett, the lawman famed for killing outlaw Billy the Kid, was born near the town of Cusseta in 1850. Joe Louis "The Brown Bomber", renowned heavyweight boxing champion, was born near LaFayette, on Buckalew Mountain, May 13, 1914. Chambers County joined its four mill cities to make the city of Valley (which is now the largest city). Valley is rapidly increasing in size and located between Montgomery, Alabama and Atlanta, Georgia. According to the U.S. Census Bureau, the county has a total area of 603 square miles (1,560 km2), of which 597 square miles (1,550 km2) is land and 6.6 square miles (17 km2) (1.1%) is water. As of the census of 2010, there were 34,215 people, 13,933 households, and 9,391 families residing in the county. The population density was 57 people per square mile (22/km2). There were 17,004 housing units at an average density of 28 per square mile (11/km2). The racial makeup of the county was 58.8% White (non-Hispanic), 38.7% Black or African American, 0.2% Native American, 0.5% Asian, 0.6% from other races, and 1.1% from two or more races. 1.6% of the population were Hispanic or Latino of any race. There were 13,933 households out of which 24.6% had children under the age of 18 living with them,42.6% were married couples living together, 19.1% had a female householder with no husband present, and 32.6% were non-families. 29.1% of all households were made up of individuals and 12.3% had someone living alone who was 65 years of age or older. The average household size was 2.42 and the average family size was 2.97. In the county, the population was spread out with 22.5% under the age of 18, 8.1% from 18 to 24, 24.1% from 25 to 44, 28.7% from 45 to 64, and 16.7% who were 65 years of age or older. The median age was 41.5 years. For every 100 females there were 91.7 males. For every 100 females age 18 and over, there were 94.7 males. The median income for a household in the county was $31,467, and the median income for a family was $39,475. Males had a median income of $34,176 versus $29,140 for females. The per capita income for the county was $16,626. About 16.4% of families and 20.3% of the population were below the poverty line, including 30.2% of those under age 18 and 15.7% of those age 65 or over. As of the census of 2000, there were 36,583 people, 14,522 households, and 10,194 families residing in the county. The population density was 61 people per square mile (24/km2). There were 16,256 housing units at an average density of 27 per square mile (11/km2). The racial makeup of the county was 56.88% White (non-Hispanic), 43.11% Black or African American, 0.13% Native American, 0.19% Asian, 0.12% from other races, and 0.57% from two or more races. 3.7% of the population were Hispanic or Latino of any race. There were 14,522 households out of which 29.30% had children under the age of 18 living with them, 48.50% were married couples living together, 17.40% had a female householder with no husband present, and 29.80% were non-families. 27.00% of all households were made up of individuals and 12.40% had someone living alone who was 65 years of age or older. The average household size was 2.48 and the average family size was 3.01. In the county, the population was spread out with 24.60% under the age of 18, 8.60% from 18 to 24, 27.00% from 25 to 44, 23.50% from 45 to 64, and 16.20% who were 65 years of age or older. The median age was 38 years. For every 100 females there were 89.60 males. For every 100 females age 18 and over, there were 85.30 males. The median income for a household in the county was $29,667, and the median income for a family was $36,598. Males had a median income of $28,771 versus $21,159 for females. The per capita income for the county was $15,147. About 14.30% of families and 17.00% of the population were below the poverty line, including 22.50% of those under age 18 and 18.20% of those age 65 or over. Chambers is a Republican-leaning county, although it has a sufficient black minority to return a respectable Democratic vote. The last Democrat to win a majority in the county was Jimmy Carter in 1980, although Bill Clinton won pluralities in both 1992 and 1996. Chambers County has been the backdrop of several movies including Mississippi Burning. ^ a b "State & County QuickFacts". United States Census Bureau. Archived from the original on 2014-08-09. Retrieved May 15, 2014. This page was last edited on 23 November 2018, at 12:35 (UTC).